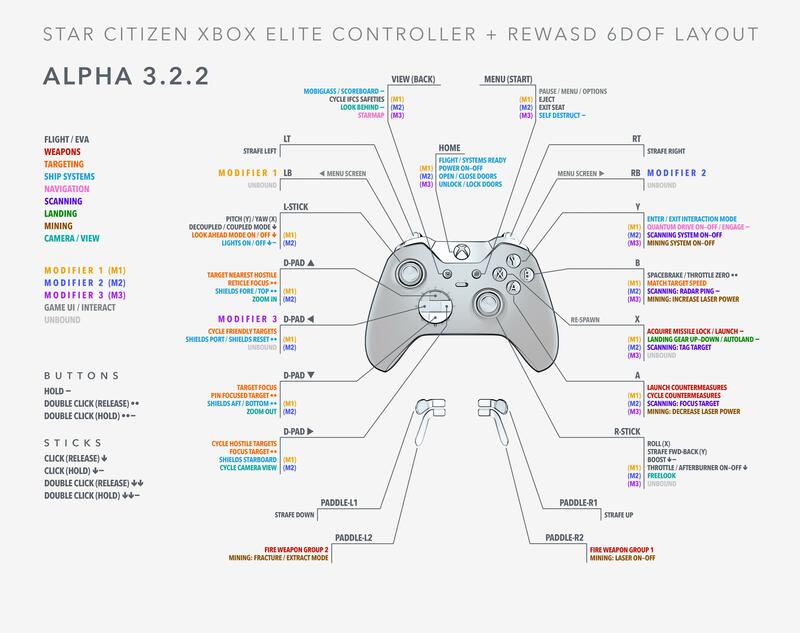 My old thread on this has been archived, and much has changed both in the controller layout, the ReWASD setup, and of course Star Citizen itself. Below you’ll find all the updated files and instructions for getting this to work. This will likely be my last iteration of this control scheme as I am waiting for twin VPC Constellation Delta sticks to arrive, and will be moving to a HOSAS setup soon-ish. With the use of an amazing little app called ReWASD, you can turn the Xbox Elite controller into a supercontroller, offering 5 analog out of 6 degrees of freedom. This latest iteration of the control layout uses 3 modifier/shift buttons, and now ReWASD allows the X button, the menu and start buttons to be utilized properly as well. Download and install ReWASD. It’s a paid app and worth every penny and some. Create a Star Citizen profile in ReWASD and then import this custom config. Make sure your controller is on and connected to your computer, and apply the config to your controller. The “apply” button is in the upper left corner of the ReWASD screen. Finally, download and install this custom XML file for Star Citizen. Unzip the file and install into StarCitizen/LIVE/USER/Controls/Mappings. Launch Star Citizen, select OPTIONS, then the KEYBINDINGS tab, then select GamePad (lower right – click the right arrow to move from Keyboard to GamePad), then click ADVANCED CONTROLS CUSTOMIZATION (lower left). Click on CONTROL PROFILES (lower right) and you should see XboxElite in the popup menu. Click on it, and in the subsequent popup you’ll see Keyboard, Mouse, and Gamepad on the left in the Device Profiles list. Select Keyboard, Mouse, and GamePad respectively on the right side Select Device to Load To list and click LOAD. You will have to import the custom XML file per the instructions above each time you launch Star Citizen. For some reason the sim doesn’t remember all the button and control assignments. I have also included custom response curves for the analog controls. There is a wide array of button and key assignments made in the Star Citizen XML and the ReWASD config. I have moved a lot more commands over to ReWASD because it works 100% perfectly where keybindings in the sim can be quite fickle. It is vital that you import all three device profiles respectively, as there are custom keyboard commands that help the Xbox controller do its work. If you make any changes to key or button assignments within Star Citizen, you will have to save a new XML export (to do this, follow the instructions above to import an XML file, but instead of clicking on the file you want to import, you must click the option at the top of the list to save the profile. Give your new file a name and save). Save your corrected XML file and reimport into Star Citizen. This can be done while the sim is running, but first back fully out of the OPTIONS menu after saving your new XML. Then go back into the OPTIONS menu and follow the previous instructions to import your new file. Star Citizen will usually save any new keybindings while you are still in the game, but make sure you export before quitting, then correct the modifier before importing it. Yes, thanks for the information — I’m going to save it for future use for sure. Unfortunately I think a lot of people here have an irrational dislike of gamepads, hence the downvotes. Can I have the XML file please?